The Meeting Place sculpture by Milt Heinrich is located on the flood plain at the base of the hill on which the fort stockade is located. This past weekend, Fort Atkinson State Historical Park and 28 other state parks and recreation areas reopened two weeks ahead of schedule. The parks were closed in October due a backlog of maintenance issues and aging infrastructure through-out the park system. It may be a cliche to refer to our state parks and recreation areas as hidden gems, but they are. The peace and quiet – solitude that can be found in many of these beautiful places is a mixed blessing. Because some are remote and lack modern conveniences they can be easily overlooked, and not get the attention and care they deserve. Fort Atkinson is certainly one of those areas that deserves more attention and care than it gets. I particularly look forward to visiting the park in autumn when the fields surrounding the fort are covered with the tall “wine stained” native grasses. Of course the Fort’s principal drawing card from Spring through fall is the Living History weekends. The first one is scheduled for May 3-4 and will continue each month through October. The park will be getting some statewide attention. Fort Atkinson is the first featured park on the 2014 Great Park Pursuit website. The GPP is a Nebraska Recreation and Park Association and Nebraska Game and Parks Commission partnership to promote active lifestyles while increasing awareness of the outdoor recreation opportunities throughout the state. The website features a different Nebraska location every few weeks. The site presents different events happening at the featured location as well as the history of the area and activities available. The park is also one of 80 attractions on the 2014 Nebraska Passport program. The program encourages travelers to explore Nebraska, collect stamps from participating attractions and earn prizes. While there are big plans ahead for the living history programs, it would be hard to match the number of visitors and the notoriety the park received in 2004 – the year of the Lewis and Clark bicentennial celebration. That was during one of my first years with the newspaper and the excitement and celebration was a joy to photograph and write about. I seldom visit the park without stopping by the bronze sculpture commemorating The First Council – the first official meeting of the Corps of Discovery and Native American in August of 1804. My favorite piece is the sculpture of Seaman, Lewis’ Newfoundland dog. The sculpture is located to the north of the Harold W. Andersen visitor center. 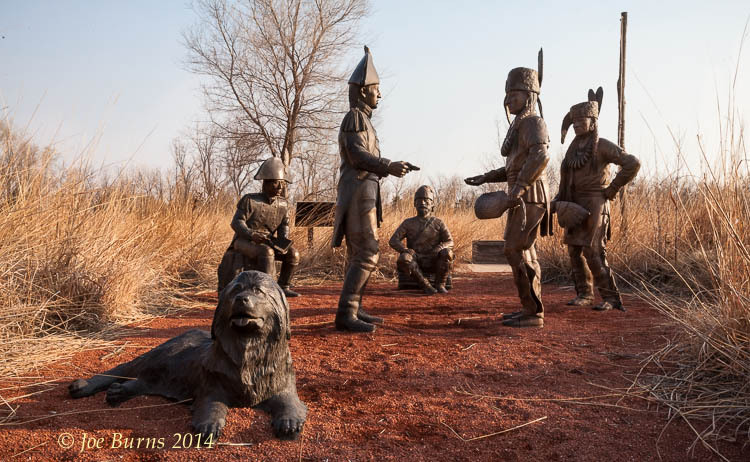 Another beautiful sculpture that is easily missed is Milt Heinrich’s sculpture “The Meeting place” that commemorates the expedition’s first meeting with Otoe and Missouri Indians. 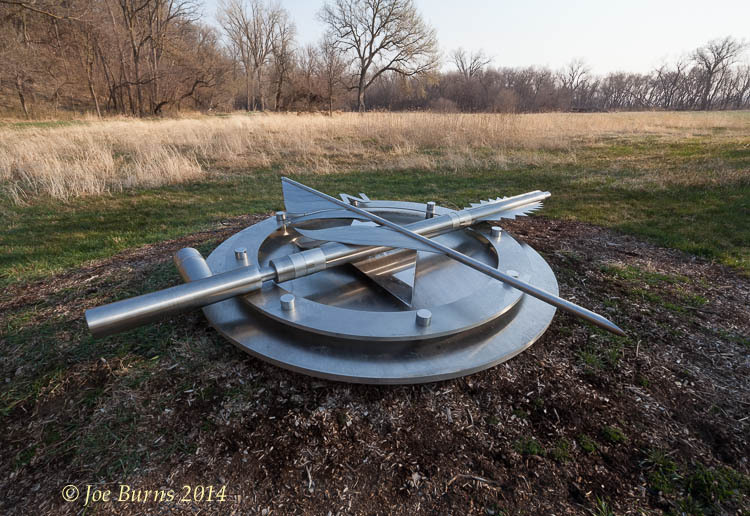 The stainless steel sculpture is located on the flood plain just east and below the fort. In addition to Fort Atkinson, there are many other interesting and beautiful parks and recreation areas across the state – some I have visited, and most I have not. My resolution for the summer and into the fall is to clean up my camping gear, and head out to some of these lesser known gems and share some of my photos and anecdotes in these columns and in my blog. First Council bronze sculpture located in Fort Atkinson Historical Park.